Fifty years ago today, in 1959, a car arrived that changed the face of motoring, with the unveiling of the Austin 7 (sometimes as Austin SE7EN) and the Morris Minor, best known as the Mini. In that half-century, the Mini has become a popular icon in today's culture, and was ranked by car experts just behind Ford's Model T in terms of overall influence to the motor industry. The Mini got its start initially with the Suez Crisis, when Egypt nationalized the Suez Canal, restricting traffic and prompting military action from Britain and France. The canal was shut down, and as a consequence, fuel prices in Great Britain rose dramatically. The British Motor Corporation (BMC) chairman, Leonard Lord, asked designer Alexander Issigonis to design a small car as soon as possible. The events of the Suez Crisis only underscored the need for such a vehicle, as it was becoming apparent that larger cars that used more fuel could become very impractical in the country. The car had only one specification: a preexisting motor had to be used, in order to cut down on costs. Issigonis opted for several other requirements: the car had to be no longer than ten feet long, four feet high, requiring the designer to maximize space inside for passengers to be comfortable. This prompted several innovations that are now widespread in the industry. The engine was mounted sideways, in the front, which allowed for the driver and passenger in front to be as far forward as possible. The wheels were in the corners of the car, and because of the size and weight, it could go rather fast - new tires had to be designed for the vehicle. The trunk could be loaded with the tailgate down for more space. The result was a car that was small, fast, minimal and above all, fairly cheap. Just after it's release on August 26th, 1959, the Mini's sales were, well, mini. The car didn't do very well in the market, with fairly slow sales, against the larger, more flashy cars from the United States, and consumers at the time saw a small car for a very small price, and because of that, were wary of the quality of the car, as well as its very basic approach to things. (The original cars didn't have radios, rollup windows or other things that Issigonis felt distracted from driving). However, sales began to pick up when icons in popular culture began to buy the car. Members of the Royal family bought the Mini, as well as pop stars such as members of the Beatles and so forth. Between 1959 and 1960, production went from just under 20,000 vehicles to over 100,000, and sales increased from there. In 1961, racing car designer John Cooper collaborated with Issigonis and came up with the Mini Cooper, a racing version of the car, to much success, and a Mini Cooper S version was created in 1963. Another element of visibility for the little car was its performance in some of the bigger races, beginning in 1963, and in 1964, with Paddy Hopkirk's victory at the Monte Carlo rally. (Incidentally, the British television show Top Gear refurbished Hopkirk's Mini Cooper S as part of a phone in vote, Restoration Ripoff a couple years ago, which speaks to the popular nature of the car.) The Mini became a contender in the racing world after that point, with its agility and speed. Top Gear did a short video on the history of British Touring Car Racing (BTC), which you can see here. The Mini had made it's mark, and the BMC continued the car by expanding its brand in a way that really hasn't been seen with a number of other cars. In 1969, the Mini Clubman was introduced, a longer version of the Mini, while its height and wheel base remained the same. By this point, the original Mini had sold over a million units, and by 1975, it had surpassed three million units. Between the 1960s and 1980s, the original version was updated a couple more times, and several additional variations were introduced, such as the Mini Van, the Moke and the Estate, but none had the lasting appeal of the original Mini. The Mini was built through the 1990s, when it was phased out in the year 2000. In 2001, BMW brought back the Mini under the moniker, MINI, with a Mini One, Mini Cooper and Mini Cooper S, to great success. In the years since, the company has reintroduced the Mini Clubman, and today, on its 50th birthday, unveiled a Mini Coupe Concept, which you can see here. There is an additional version in the works, set to be released sometime next year, called the Mini Countryman or Crossover. In 1969 the Mini Cooper's enduring influence in popular culture was further cemented with the release of The Italian Job, starring Michael Caine and Noël Coward. The film is centered around a gold heist by a group of thieves, who use a trio of Mini Coopers as an integral part of the heist. The cars were the true stars of the film, with one of the best car chases that I've ever seen. The cars were used once again in the movie The Bourne Identity, with another exciting car chase. 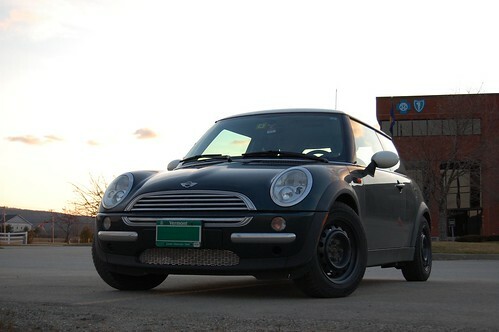 With the introduction of the new Mini Cooper to the public, a remake of The Italian Job, featuring the updated Mini Coopers, was released in 2003, and was the highest grossing film for Paramount Pictures in that year. Once again, the Mini Coopers were the stars of the film. A Rebel Without Pause, a short film done by BMW looks into the popular culture aspect of the Mini. This is where I was introduced to the Mini Cooper, and I remember pretty clearly when I first fell in love with the car. I was in my 3rd or 4th year of working at YMCA Camp Abnaki, and on a weekend trip, I caught a ride in with a group to the theaters, where I saw the Italian Job. The Minis were spunky, quirky and fast, very different than the car that you see every day. I remember thinking: I want one of those cars. Over the next couple of years, I looked at them off and on, until last fall, when I somehow got onto a website selling them, jotted down figures and decided that I could afford a new car to replace my other one. Things were starting to go wrong with that one, and the time was good. I went out and after test-driving a couple, I found my own one, and bought it that weekend, learning to drive a manual transmission along the way. One of the things that I'm most impressed with, looking over the history of the Mini, is the appeal to popular culture that the car has endured over the years. It has been part of movies, of celebrities and races, and it turns heads where ever it goes. The interesting thing that I see is that Mini has become a brand, something that hasn't really been done with a number of cars. There is an enduring Mini-look that is easily adapted to other vehicles, such as the Clubman, the Countryman, Traveler, pickup, Cooper, etc. This helped with the re-launch of the brand, which has made it so popular in recent years. When I drive along, I see other Mini drivers who wave, and the like, which is something that the company has capitalized on with their marketing, and far beyond just building a car, have built an entire community of people who have something in common. That sounds a bit dopey, honestly, but it's true - I've never felt any sort of connection to fellow Chevy Prism or Toyota Camry owners, that I have with the Mini. I absolutely love my car, as I've written about before. The entire experience of driving it differs from anything that I've driven before, and I often will break out into a grin when I'm driving along. I love throwing Maxine into corners at speed, accelerating along straits and simply enjoying owning a car. I don't believe that a car should be boring, or simply just to go from point A to B during commutes. That just seems dull, and that just seems like a waste. Happy Birthday Mini. Here's to another 50 years.